For almost two weeks Penns Creek wasn’t in good shape. Storms and runoff pushed the creek to unfishable levels. We were in town to film Pautzke Outdoors and struggled to find any water clear enough to fish. Fortunately, Sinking Creek was running clearer and at least provided us with a backup plan. 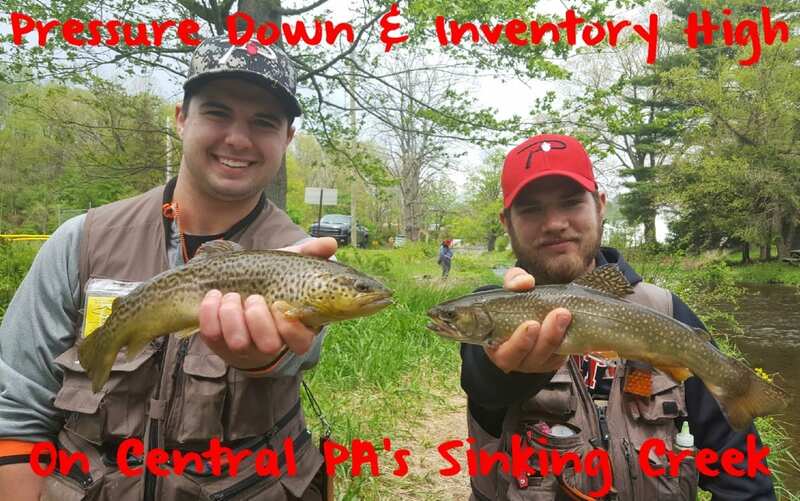 Sinking doesn’t offer the same quality trout as Penns, but was loaded with trout. Sinking Creek is no secret to locals or out-of-towners. A tributary to Penns and in the town of Spring Mills, Sinking is a put-and-take stream stocked by the Pennsylvania Fish & Boat Commission. This isn’t a year-round trout stream. Most locals agree that by summer the creek is too low and warm to maintain trout. Still, with hopes of other anglers enjoying the same success we did we caught and released a few dozen trout here in about two hours. We didn’t see any golden rainbows. Meanwhile, browns, rainbows and brooks were present. Most of the fish we caught were browns. I think more than 80 percent were browns. The good news is they didn’t stock dinks. We didn’t catch a trout smaller than 11 inches. Some stretched 15 inches. All were caught from the bridge in Spring Mills on upstream for about a mile. While we had a truck full of Fire Bait and Pautzke salmon eggs we didn’t use a single jar. Instead, we opted for live Chartreuse & Blue Fire Dye minnows. These were small minnows and didn’t last more than a few seconds on a drift without getting bit. Most of the time we fished them under a small float with four-pound test and on an Eagle Claw hook. The bite was so good we ran out of four-dozen minnows in about 30 minutes. Fortunately, after getting more we did the quick soak with Fire Dye on another batch and the bite resumed. Sinking will fish well for a few more weeks as pressure has dwindled. Most of the trout we caught came in the meat of the hole. We didn’t catch any near the beginning of the holes, which could have been just that day. There’s a lot of water to explore and fewer anglers. It’s perfect conditions. Editor’s Note: Pautzke’s new Fire Dye is available at FishUSA.com, Bass Pro Shops and the following PA Walmart locations: Bradford, Clarion, Erie (West), Exton, Greensburg, Harborcreek, Harleysville, Johnstown, Latrobe, Mechanicsburg, Montoursville, Pittston, Reading (North), Somerset, Belfonte, State College, Tunkhannock, Washington, Waynesburg, Whitehall, Wilkes-Barre and York.